These days, pictures of boudoir genre are gaining huge popularity all across the globe. You see models and women wanted to get boudoir photo shoots done and there is something quite sensual yet attractive about these pictures.Boudoir photography is the attraction of the day in the word of photography. Women are gifting these to their fiancés and husbands. This makes it a great chance for women to reveal their sensual side to their partner before the wedding day. This definitely comes about as a beautiful yet tantalizing gift for their partner. When you want to get sensual pictures clicked, then you must go to none but an experienced Boudoir photographer Dallas. Bear in mind, not every photographer is skilled in this area and it needs experience and the right skills to achieve the right pictures. Before you get started with the shoot, it would be good for you to have a fair idea about what to expect during a boudoir photo session. Boudoir is chiefly a French word which means a private dressing room or bedroom of a woman. Talking the photography point of view, it would mean getting pictures clicked where a women is either dressed partially or in a sensual lingerie. Pictures will for sure look quite sensual and tasteful yet highly elegant. These pictures depict how women feel at a particular point of time. Just as you select a wedding photographer you have to ensure you go through the same way when it comes to selecting a photographer for your Boudoir photo session. Make sure in particular, that you select someone who is experienced and makes you comfortable at the same time. Make sure that you do interview and meet a few photographers; you will gain an idea about their work and how well your comfort level is when working with them. After you have passed the first hurdle of selecting a photographer, select a place where you want the pictures to get clicked. You could get them clicked in the studio where you can find beds and chairs which will help to build the ambience of this kind of photography. You could also use a hotel room or probably a private place for the photo shoot. Usually, the pictures that are clicked in this kind of photography have women adorning lingeries. However, this does not mean you have to start shopping for different kinds of undergarments. You have to understand what your objective is, whether you want pictures for album, or a pinup or glam ones. You can even adorn modest outfits and get some amazing pictures clicked in the right setting. You might be an aspiring individual who has a lot of dreams which runs within you. If we are to talk about dreams, you must be coming up with ideas almost every day. But, this article will look into one idea which is perfectly executable. Talking about a perfectly executable idea, event management has become one of the best streams to invest in. Well, if you are an individual who does not have a huge capital at your disposal, you could simply start off by organizing charity events. It’s always good to start small and work your way up in the industry. Firstly, you could organize a small batch party at school. You could talk to the officials at school and ask them to give you the chance. If you do not get the ability to steer the event, you could try working with the start. This way you’d be able to make sure that you get the necessary exposure. During the early stage it’s important to make sure that you get yourself some good contacts. This will help you greatly, when you start up your own company. Some individuals have a tendency of stepping into the event management business without getting themselves any contacts. Doing this could result in various different scenarios. For instance, you might get the opportunity to plan a huge event only to have no one to reach out to. Therefore, it’s important to make sure that you have the right contacts in the industry. For instance, if it’s a wedding event, you might want to have the contacts of the best wedding photographer so that awesome pictures could be captured. You could also try and making contacts with individuals who have experience in professional wedding photography in Sydney. This way you might not need to outsource them and this could cost you less. If you want your business to be successful, you need to make sure that you have enough contacts. For this to happen, you need to be in the industry for quite some time. To view pricing of wedding photographers please click here. Therefore, if you are planning on starting up a venture, you could always make it a point to get the necessary experience. Furthermore, you could start off small at home where you manage small events. If everything takes off, you could simply move towards successful events which are in a large scale. For instance, you could make it a point to start off with parties only to do concerts which feature big artists. Such events might easily elevate the reputation in your company. Even though the event industry is an easy industry to start in, it’s quite hard to maintain the reputation at all times. There are so many players in the industry and there are times where it might get messy. As a photographer, one of the most successful avenues of your career will be weddings. You can be rest assured there will be no shortage of work as it is quite a busy industry. It will take some time before you feel confident enough to shoot one of the most important days of someone’s life, yet you have to start somewhere. Starting with friends and family is a good way as you can collect shots as well as gain experience. Quite frankly, the camera and your skills are not even half of what it takes; as a photographer across all disciplines, there are some factors that contribute to your success. You find this listed as a requirement in most job vacancies, and though it seems silly it is in fact quite necessary. 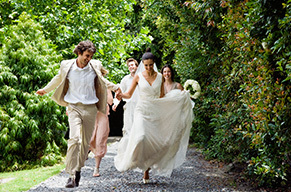 You must interact with people in order to do your job well, and as far as wedding photography in Sydney is concerned, contacts is how you are going to mainly build up your database and reputation. You need be courteous, friendly and open to constructive criticism no matter how long you have been in the industry. Be humble, accepting and willing to correct yourself not arrogant and an insufferable know-it-all. Things are prone to go wrong even at a wedding and as a good photographer you will not only know this, but also be prepared for it. The ability to think on your feet and rescue a situation is something that will really add weight to your profile as a wedding couple will want not only a photographer, but also someone who is able to keep that side of the wedding under control. Rain interrupted an otherwise lovely reception? Turn it around and capture some stunning images instead. Especially when you are a newcomer, it can be quite easy to get pushed around as you try to please everybody, however the truth of the matter is that you cannot make everybody happy. When it gets to one of these times, think about who is paying you to do your job and what it is that they want. The couple is what is important here, not the whining of the other guests. When involved with wedding photography you need to be firm, but not rude and make your decision and stand by it. Nobody like the same old thing, and today people think up fun and creative things to incorporate into their wedding pictures. Perhaps beforehand, it would be good to meet with your photographer and find out what their style is and whether it agrees with you. You can even run some test shots and see what works for you, so on the actual day you need not run about. Look well in advance for the best choices. Capturing The Best, Jaw Dropping, Crazy Moments Of The Function! Having a photo booth at a wedding, graduation party and so on, is a lot of fun to have. You would want to cherish as much as crazy moments with your friends, before you’ll be going your way. On the other hand, choosing a company is not an easy task, as you would come across many options. Some many boast about their professionalism, but have poor records or evidence to confirm it. Other companies would be using the best equipment and higher quality work. Moreover, a reputed company would only provide varying packages but also give it for affordable prices. Do you prefer the traditional or modern booth? Most professional companies that have excellent wedding photo booth hire in Sydney would ask for your choice. Other than the enclosed traditional booth, they also have the open booth that is against a backdrop of your choice. What are the services you are looking for? Depending on the package that is chosen, you would be offered a large number of backgrounds to select. Choose funny, crazy, extravagant and many other more. Moreover, with latest technology, you also have the option of customizing a backdrop. What are the extra choices you are looking for? There are a number of things that you would be asked, regarding extra features of a package. For instance, if you’re planning to have a cubicle of photo booth rental in Sydney for your kid’s birthday, this might be really helpful. You could get personalized key tags, bookmarks, photo collages with the pictures and many more. How long are you planning to have the photo booth for? These packages are offered for a restricted time period. A professional company might have unlimited hours, which would be there until the function finishes. It could be a little as 2 to 3 hours to unlimited. Based on the budget and above features, you have many choices to select from. These are a list of items that you would be finalizing with the photographer, company you’re hiring. Therefore, plan and select the best options and captured the best, crazy, awkward, jaw dropping and many other moment of the function.